Looking for a theme party idea? Themes turn an ordinary party into a special occaison - and with good costumes you can really create a fantasic atmosphere. 1920s murder mystery parties: Parties set in the roaring twenties - a time of flappers, gangsters and Bright Young Things. Christmas murder mystery parties: Festive parties suited to Christmas. Female only murder mystery party games: Women only - no men allowed! Halloween murder mystery party games: Spooky murder mystery games ideal for Halloween. 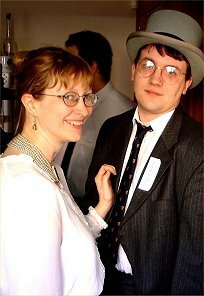 A Murderous Year: Murder mystery parties for annual holidays such as Valentine's Day, St Patrick's Day and the like. Murder mystery games suitable for fund raisers: Large murder mystery games ideal for fund raisers. Nautical murder mystery parties: Parties set aboard ships of all sorts. Pirate Parties: Arrr, shiver me timbers! Theatrical murder mystery games. Actors, actresses, directors and producers. Lights! Camera! Murder! Wild West: Murder mystery parties set in the American Wild West! Victorian themed murder mystery parties: Parties set during the reign of Queen Victoria. Spellbound is a magical mystery party set in the Tremaine school for wizards. Find out what happened to Professor Bennet! For 13 to 17 guests, plus one host. A Heroic Death is a superhero themed murder mystery party for 8 to 12 guests, plus one host.